At supper that evening, Aubrise shared her worries with Tehuti. He laughed when she reached the part about Sarina walking out in a huff. "Good for you!" the Techo laughed. "She has a very high opinion of herself - too high in fact! She needs to be put in her place once in a while and realise that the Gebmids are of interest to everyone, not just her personal private puzzle." Relieved by his reaction, Aubrise smiled and settled back in her chair with a cool drink. The following morning, Tehuti arranged for Aubrise to go out to visit the Gebmid. "It wouldn't be safe for you to go out there by yourself," he explained, jumping onto the cart with her. "The desert can be very dangerous - poisonous snakes and bugs, pockets of quicksand, groups of thieves who attack passing travellers; not to mention the risk of dehydration and probable death if you run out of water." "No risk of that today, I think." Aubrise grinned, looking at the large pile of water bottles the Techo had loaded into the back of the cart. "Better safe than sorry," he cautioned, winking at her. As the cart rumbled through the desert, Tehuti told Aubrise about the discoveries that had been made so far. The Cybunny listened, fascinated, to his account of the discovery of the Gebmid, buried below the sand with just the very top sticking out. He explained that Sarina Salen had been intrigued by the discovery and travelled to Sakhmet at the request of Princess Amira - the ruler of Sakhmet - to start an archaeological dig there. "She said someone built the Gebmids and she was going to find out who did it," Tehuti finished, as the cart headed down into the dip created by the unearthing of the Gebmid. "Welcome to Sutek's Tomb," he added, as the cart stopped. As Tehuti tethered their Apis to a large stone block, Aubrise jumped down from the cart and looked up at the Gebmid towering above her. The sun was high above the desert by now, and she squinted a little as she tried to see the very top. A Horus circled overhead, black against the sky, and she could hear bugs scuttling in the sand around the base of the Gebmid. Its sides had been weathered by hundreds of years of buffeting by sand storms, but the walls were still solid, hiding their secrets within. The only entrance lay down a slope, barely peeking out of the sand which had hidden it for so long. "Mind your step," Tehuti called, as Aubrise grabbed her backpack and slithered down the slope. Lifting one of the water flasks and his own bag from the cart, he followed her. She had stopped at the doorway and was examining an intricate set of carvings around the door. "Fascinating..." she murmured. "Did Sarina make a note of these?" She rummaged in her bag, pulled out her notebook and carefully copied them down. "Do they mean anything to you?" Tehuti asked, setting down the flask just inside the entrance. "They remind me a little bit of ancient Qasalan, but there's an entirely different set of characters here as well. This triangular glyph appears a lot too," she commented, indicating a small character on the wall. "I noticed that as well," Tehuti replied. "We speculated that it was a symbol for 'Geb'. Modern Geb are very, well, Gebmid-shaped..." He trailed off as Aubrise gave him a look. "You could be right," she said, turning back to the wall. "If the other characters here are ancient Qasalan, this looks like a dedication to the Geb interred inside... and... Is this a warning?" She frowned at the wall as she quickly dug into her bag for another notebook. Pulling it out she flipped open the pages until she reached the one she wanted. Muttering to herself, she squatted down in the sand and quickly cross-referenced the glyphs on the tomb with the notes in her book. After a few minutes she frowned again and looked up at Tehuti. "Has anyone ever mentioned there being a curse on the Gebmids?" she asked. "We did have a theory last year," he replied. "We couldn't translate this inscription fully but we thought we'd made out the words 'whoever', 'disturb', 'rest', 'interred forever', and 'tomb'. Sarina didn't think there was a curse though - she thought it was just a blessing on Sutek, the Geb inside." "She needs to spend more time looking at books and less time with her head in the sand!" Aubrise muttered. "If she really studied those books she keeps referring to in her journals instead of just skimming through them for interesting parts, she may change her mind!" Tehuti waited for her to continue, unsure what was coming next. Aubrise stood up, put the second book back in her bag, pulled out a torch, and brushed the sand off the bottom of her robe. She shouldered her backpack and grinned at Tehuti. "Are you coming then?" Then she turned and entered the Gebmid. It was dark in the corridor and cool - a refreshing change from the incessant heat of the desert. Tehuti followed her in. "Wait!" he called. "What?" Aubrise asked, turning to examine a wall. "Is there a curse or not?" he asked. "And if there is, should we really be in here?!" "I've seen inscriptions like this before. Besides, in order to disturb his rest we'd have to get into the inner chamber, and from what I've read so far, you're not even close to doing that yet! Now come on!" She grabbed his arm and pulled him down the corridor. Corridors led off from the main passage at irregular intervals, and closed doors hid chambers from view on both sides. Eventually they found an open door. Aubrise shone her torch inside. The chamber was completely empty. Tehuti set down his bag and pulled out a lamp, filled it from a little flask of oil and lit it. He was about to enter the room when Aubrise held out a cautionary hand. "Wait a moment - let me check first." She shone her torch around the doorframe, examining it in minute detail. Then she relaxed. "It's okay, we can go in." "I thought you didn't believe in curses," Tehuti commented as he set the lamp down in the middle of the room. "I don't," Aubrise replied, swinging her torch around the walls. "But there may be hidden mechanisms, a trap door, a pit in the floor, or goodness knows what else. If there is, there's likely to be a warning on the door." Tehuti took out the flask of water from his bag, took a drink and offered it to Aubrise. She took it gratefully. 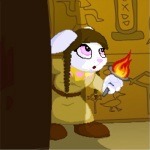 "You know, Sarina found a lot of hieroglyphs on these walls. She thought they told the story of how the Gebmid was built and why," the Techo told her. "She didn't get very far with the translation, though - after she'd discovered Sutek's name she decided she'd find out more from investigating deeper into the tomb and perhaps finding relics or even a burial chamber." "She prefers action over research," Aubrise observed. Tehuti nodded, and lifted the lamp to illuminate the walls. "To give her credit, she has discovered several interesting artefacts, including some scrolls we believe could contain records of the Geb living in this area around the time this Gebmid was built. But personally I believe you should always be well researched before you take action. And these are just incredible." Aubrise got up and ran her fingers over the hieroglyphs. "Can you understand them?" she asked. "Some," he said. "Sarina made a copy of everything written here and brought it back to the archives when she first discovered the chamber. It seems to show a ruler who was loved by his people - Sutek. He commissioned the Gebmid as a memorial. There are some parts I couldn't read, though." He got up and joined her, pointing up towards the low roof. "This part in particular." The Cybunny looked at the section he was pointing at. "I think it's another name," she said slowly. "Look here, this line underneath the symbol means it's a person. 'Don-kor'," she read carefully. "'Donkor'. And this symbol means 'builder'. He must have been the Geb in charge of the construction project." She smiled excitedly. "This is what I love about history. I bet no one has spoken these words in a thousand years, and yet now we have!" Tehuti smiled back at her. "So can you read the next part?" he asked. She turned back to the wall, her face screwed up in concentration. After several minutes, she said, "It talks about traps. About the need to stop robbers getting in, and how Donkor designed traps to stop them. And this here." She pointed to a large, intricate glyph. "This isn't a glyph, it's a picture. That's why you've had problems deciphering it. It's a lock designed to stop anyone from getting in to disturb Sutek's eternal rest or stealing his treasures and his secrets." Tehuti's eyes lit up. "That's incredible!" he cried. "Can you decipher the rest of the walls?" For the rest of the afternoon, Aubrise and Tehuti worked to decipher the hieroglyphs covering the wall of the chamber. As the sun started to sink in the sky, approaching the horizon, they finally emerged from the Gebmid. After untying the Apis, Tehuti swung the cart around and they headed back to Sakhmet. As the cart pulled up outside the Archives, a Wocky rushed out to meet them. "What?!" they both exclaimed, Tehuti jumping up and almost falling out of the cart. "Tell me what happened," he demanded. "She's gone! No one can find her anywhere! She went out into the desert after lunch today as usual and now she's gone!" A few minutes later they were in Tehuti's office. The Wocky had slumped down into a chair and Aubrise was pouring him a cold drink. Tehuti was pacing the floor, looking worried. "Do you think she's had an accident?" Aubrise asked him. "I don't know," he replied. "If she hasn't, then it means she's lost somewhere in the Desert, or else..."
He stopped pacing and looked at her. "Are you sure you don't believe in curses?" She stared at him, not sure what to say. "Never mind," he continued quickly. "We have to tell Princess Amira - Sarina was here as her guest."